My Canadian friend Ian is back in town, and i just love cooking dinner for him and mutual friends. So here’s the dinner. On the kitchen table as little appetizers: Crackers, a truffle mousse by Fabrique Délices, and my own pickled jade beans from McGinnis Ranch. Salad of Rocket, Radish, and Sautéed Pimientos de Padrón all from Happy Boy Farms, dressed with a vinaigrette made with walnut oil and my berry vinegar. Sour Flour sourdough bread with Springhill unsalted Jersey butter. Shrimp Poached in Butter on a bed of Polenta, a variation of Michael Rullman’s recipe that i experimented with last month in my slow cooker. Okra Sautéed with Red Onion, New Mexico Chiles, Sweet Peppers, and Purple Cherokee Tomato from Happy Boy Farms. This is Okra in my Recipes. Was thinking i’d braise some spinach as an alternative vegetable since i had a feeling that Canadians don’t eat okra and there would be three of ’em at the table. Ummm, plus two Yankees, and we know for sure about them. Then checked and discovered, wonder of wonders, they all like okra. Sure was wonderful to watch a bunch of Canadians and Yankees gobbling up okra. Fresh Cranberry Beans with Chantenay Carrot and Red Onion. The beans are from Busalacchi at the Heart of the City Farmers’ Market and the carrot is from Tierra Vegegables. I’ll have some Oakdale Cheese quark on the table for folks to plop into the okra and/or the cranberry beans. The quark tastes much like sour cream but since it’s only about 5% fat, it’s actually good for you, and it’s a marvelous addition to both beans and spicy dishes like that okra. Flourless Lime Almond Torte. This is a recipe i got online from Simply Recipes although i did tweak it a bit when i tried it last week by substituting lime for the lemon zest and using lime juice instead of the vinegar. Oh, and this time i upped the recipe 20% and got away with it. I use almond meal from Rodin Farms at the Castro Farmers’ Market. I bought a pint of Three Twins Madagascar Vanilla ice cream for an optional topping, but instead used that quark with a little sugar stirred into a small bowl of it. Oh, and i cast a handful of pohas (Physallis peruviana) from Tierra Vegetables and baby kiwi fruit from Alpine Blue Farm onto the plate – neither of which, as best i can tell, is available from any other source in San Francisco. Was planning to add some crunchy texture with a few sesame glazed almonds from Rodin Farms but forgot ’em. 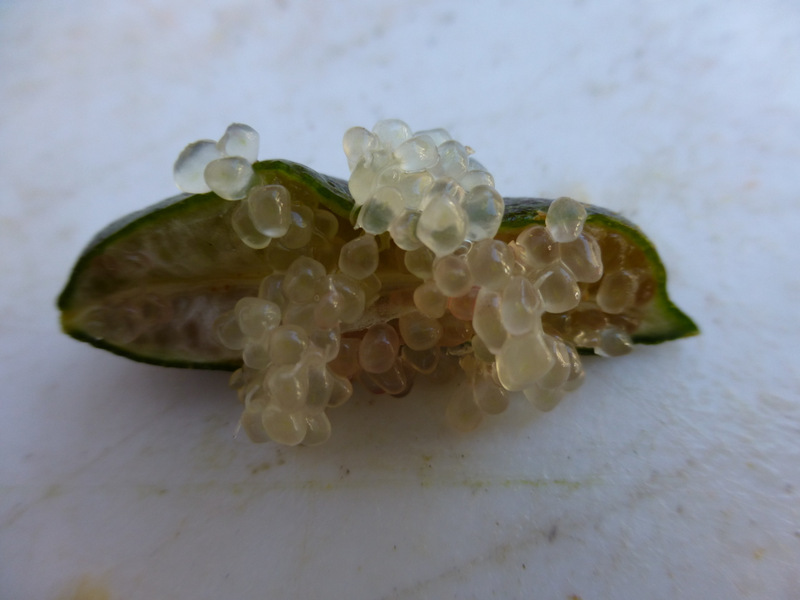 For today’s food-related photo i’ll use this one of the caviar lime (Citrus australasica), also known as the finger lime. Vince Bernard brought a handful to the Castro Farmers’ Market the other day to show us although he doesn’t have them to sell yet. They’re delicious and the little balls pop like tobiko. Yum.